Student Support Assistants (SSAs) were trained in each community to be the local “experts”. Teachers were also trained in larger groups and hands on training was provided to all. 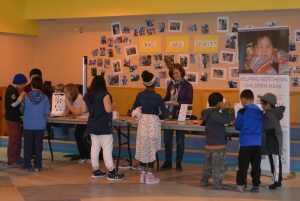 We had a successful Hearing Fair that allowed children and their families to learn more about hearing and hearing loss. Thanks to Keith Wyatt for installing Soundfield Digimaster towers in all elementary school classrooms in preparation for the launch. Teachers were trained in larger groups for general information and then in their classrooms the next day for individual attention to ensure they were comfortable with the systems. During conversations some teachers wondered whether some of the kids in their class who “just don’t seem to be getting it” might be because they don’t hear. SSAs received advanced training about the equipment because they are the technology experts. While in Pangnirtung the heat went off and all children were sent home but an SSA said, “I’m not leaving, this is way too important. I think hearing is a huge issue and we need to learn how we can help.” We happily completed the training with our coats on. Hearing Fairs were a huge success, attracting many people to attend and learn about hearing loss, hearing protection and to start removing the stigma attached to wearing hearing aids. The Sounds in our Community was another great success, rewarding winners for art inspired by listening to sounds outside. Conversations with community people and leaders confirmed that Bheny was having a powerful impact in addressing hearing awareness and needs. Several key additional opportunties were identified and we are pleased to provide support to ensure sustainability.